It was the age of "Yeah, yeah, yeah," Carnaby Street couture and "Bond, James Bond." The Beatles ruled the world of popular music, having launched the "British Invasion" with their performances on The Ed Sullivan Show early in 1964. A year later that takeover was in full force, and yet for Frank Sinatra, on the verge of turning 50, 1965 would be a very good year. Sinatra had already seen his fortunes rise and fall and then rebound to heights he could never have foreseen during his youthful years as the singing idol of "bobbysoxers" everywhere. Down and nearly out by the early 1950s, his Academy Award winning supporting performance in 1953's From Here to Eternity and his move from Columbia to Capitol Records, also in 1953, marked the beginning of an astonishing career renaissance. His movie career flourished following his Oscar win and he went on to star in several noteworthy films into the late 1960s. The records he released during his years with Capitol would be considered the finest of his career, and it was during the Capitol years that he began his legendary collaboration with arranger Nelson Riddle and began recording "concept" albums. By 1960, the buzz created by his close friendship with JFK and his celebrated sold-out "Rat Pack" shows in Las Vegas had elevated his status above and beyond any mere "A list." He was now in a league all his own and would soon form his own record company, Reprise Records, and hold other business interests, including a charter airline and a film company. "Beatlemania," a term coined by the media to describe what it expected would be another short-lived fad, not only did not subside, but continued to spread unchecked across the globe. In truth, the British Invasion was a catalyst for a world-wide youth movement. Old was out and young was in, and the impact of this on the careers of many stars of the pre-Beatles era was devastating. And yet, in 1965, the dawn of the "Youthquake," Frank Sinatra would be propelled to the next plateau of his career. The core of his repertoire would remain the American Songbook - the music of Cole Porter, the Gershwins and others - but he would occasionally, and wisely, add new material, very often written expressly for him. June 20 - Officially known as the "Frank Sinatra Spectacular," Frank, Dean Martin and Sammy Davis, Jr. perform a live benefit concert at the Kiel Opera House in St. Louis. The show, emceed by Johnny Carson, is broadcast into theaters in ten cities, including New York and Chicago, via closed-circuit TV. 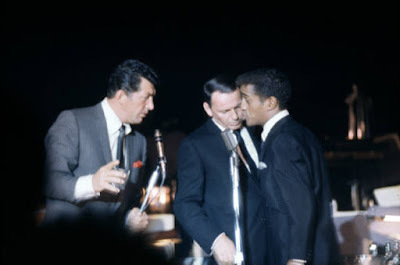 The concert is filmed and is purportedly the only existing footage of the "Rat Pack" act they regularly performed at the Sands in Vegas. June 23 - Von Ryan's Express, a WWII POW escape film in the vein of The Great Escape (1963), is released. Sinatra is the top-billed star and the movie is a big hit. July 4 - Sinatra performs with Count Basie as the main attraction at the Newport Jazz Festival. 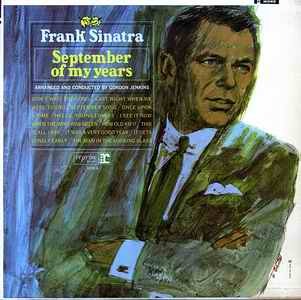 September 1965 - Sinatra's September of My Years LP is released on Reprise. It contains a landmark hit single, "It Was a Very Good Year." The album will go on to win the Grammy Award for Album of the Year and the song will bring Sinatra a Grammy for Best Male Vocal Performance. 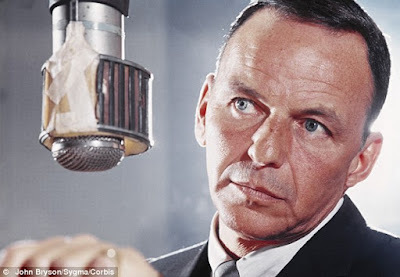 "It Was a Very Good Year" becomes Frank Sinatra's first #1 single on Billboard's Adult Contemporary chart and will also track on Billboard's Pop chart. 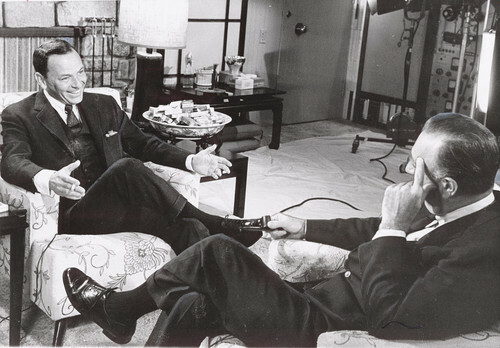 November 16 - CBS broadcasts a black-and-white documentary, "Sinatra: An American Original" featuring a sit-down interview with Walter Cronkite and footage of Sinatra's recording sessions for September of My Years. Working behind the scenes on the production are producer Don Hewitt and writer Andy Rooney, who will both go on to great success with 60 Minutes. November 24 - NBC broadcasts a one-hour color special, "Frank Sinatra: A Man and His Music." 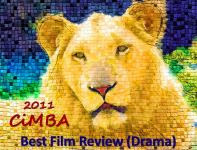 The show will earn an Emmy Award for Outstanding Musical Program and is such a success that two follow-up specials will be produced. November/December 1965 - During the 1965 holiday season, peerless pioneer of the "new journalism" Gay Talese travels to Los Angeles and begins his fabled profile of Sinatra for Esquire magazine. Because he was suffering with a cold, Sinatra cancelled his interviews with Talese who was left to develop the profile without direct access to his subject. He accomplished this by observing the star's entourage in relation to Sinatra's ill health. Published in the April 1966 issue of Esquire, "Frank Sinatra Has a Cold" is generally regarded as the most famous celebrity profile of all time. The definition of "cool" changed in the mid-'60s and Sinatra would no longer rule that kingdom. He would transcend it. Dubbed "the Voice" early in his career, his style matured and he developed an unmatched gift for interpreting lyrics and conveying emotion. 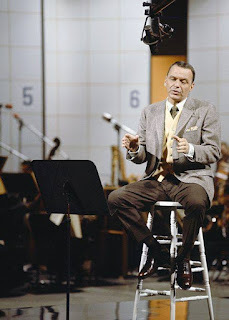 Walter Cronkite said of him, "People who understand music hear sounds that no one else makes when Frank Sinatra sings." Others flatly insist he was the greatest popular singer of the 20th Century. 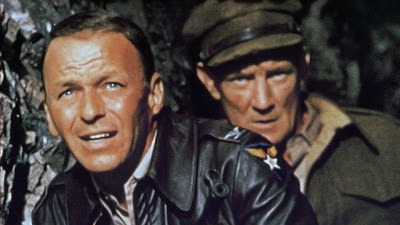 This is my contribution to the Sinatra Centennial Blogathon hosted by Movie Classics and The Vintage Cameo. A great choice, to examine this pivotal year in Sinatra's career, and a very well-written post. Thanks for this interesting look at the fortunes not only of the singer, but of the American Songbook in this period of such astounding change. Thank you Jacqueline. 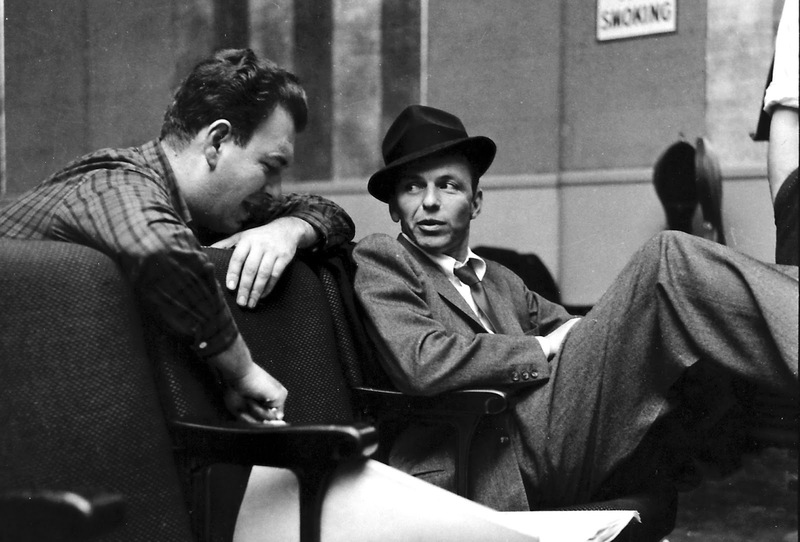 Hopefully, thanks to Frank Sinatra and a few others, the American Songbook will live on. As a kid at that time I knew I was supposed to like The Beatles, but honestly, I didn't get them. My favourite singers were Perry Como and Nat "King" Cole. Frank was with Ella and Benny Goodman in being the albums I wasn't allowed to listen to on my own for fear of breakage due to an earlier incident with Bing. So, I really understood early about Frank being in a league of his own - way up there on Mount Olympus. Thanks, CW. I was one who knew and liked Sinatra through his hits of the late '50s and early '60s, before the Beatles. I nearly forgot him when the Beatles came on the scene (but didn't). In the end, both ended up on Olympus. That was a very good year indeed! 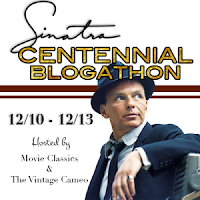 Thanks for this thoughtful contribution to the blogathon - amazing to think of all these successes for Sinatra in the era of The Beatles, as you show here. Hi, Judy. Looking back, I was fascinated that Sinatra managed to do more than just "survive" the Beatles and the shift in popular music. Speaks volumes of his talent. I remember seeing A MAN AND HIS MUSIC when it came out back in '65. My mother was a Sinatra fan and I was a closet Frank fan, but could not admit it at the time. I would only admit to liking Rock and Roll. This is a wonderful overview of what had to be one his many highpoints in a career filled with them. excellent stuff. Thank you, John. Thinking back, I know that I loved "It Was a Very Good Year" from the start, but I wasn't paying much attention to Sinatra then beyond that. But I came back to him. How could I not? Great post! Like Caftan Woman said, you've providing fascinating context for us. Yup, seems like '65 was a very good year. Frank Sinatra had such a long and diverse career that its difficult to grasp it. A couple of years ago we had an exhibit in his honor at the Coronado Library and people slightly younger than his generation either loved him or despised him (because of his alleged mob connections). Now he's mostly remembered because of his Rat Pack days.It's more difficult to fully understand the huge contributions he made to American music in the Capitol Records years you point out. Thanks, Christian. Sinatra had a really interesting career trajectory and it's always interested me. When it occurred to me that a pivotal moment occurred in the midst of the British Invasion, I had to investigate further. As for the Rat Pack period, sadly, I think it is given disproportionate significance. Frank's successes in 1965 really show true talent will always triumph and find an audience, even if the prevailing trends are for much different styles. It seems the great ones always transcend the moment; they have a talent that is timeless. Great article, Eve. I'm one of those people who "flatly insist he was the greatest popular singer of the 20th century". Sinatra was the greatest interpreter of the greatest songs (the American standard songbook) composed by the greatest generation of songwriters: Kern, Porter, Rogers and Hart, Gershwin, Berlin, Arlen, etc. Sinatra took things to a whole other level, he personalized the songs and brought out not just their incredible musicality, but also their meaning. I admit, I was never a fan of the Rat Pack, but it was Sinatra, the interpreter of songs, that I put on the top of the mountain. Loved the Beatles, The Byrds, The Stones, Procul Harum, The Doors and so many of those truly creative bands that came after the Beatle revolution, but even though Sinatra was of my parent's generation, his music spoke to me in my childhood and still speaks to me now. Sinatra is The Voice. What a beautiful article! It's amazing that Sinatra survived the Beatlemania and endured as the greatest voice of the 20th century. He surely had something special! You did a great account of the year one of my favorite "Sinatra" tunes, It was a very good year, was released. Congrats! Thank you Le - I'll be sure to check out your contribution to the "Sinatra-thon"! Eve, I'm a little late to the party! I think Sinatra was without peer in his whole persona. His voice in its prime was the best in the business. I always loved "It Was a Very Good Year" so much. I was an early teen then, and it made me cry. It was an embodiment of the great orchestra and arrangements that combined with Sinatra's phrasing and golden voice. Thanks for this tribute to a great showman! You can never too late to a Sinatra party, Becky. I was moved by "It Was a Very Good Year" when I was very young, too. I'm still moved by it, but with all the years and experience since, it's a deeper, richer emotion now. Thanks for stopping by, Becky!